Our product range includes a wide range of stainless steel masala dabba, stainless steel lunch box, stainless steel dabba and lunch box. 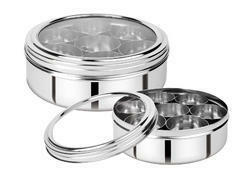 Running with a purpose of attaining highest level of customer gratification and trustworthiness, we are offering a distinctive assortment of Stainless Steel Spice Box to our respected customers. Accessible with us in miscellaneous standard sizes and stipulations, we also provide the facility of altering their sizes as per the necessities and requirements of our patrons. Furthermore, we deliver these in best grade packing material to our customers. 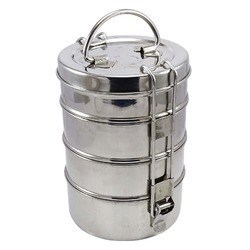 We are an eminent organization engaged in manufacturing a wide assortment of Stainless Steel Lunch Box to our clients. 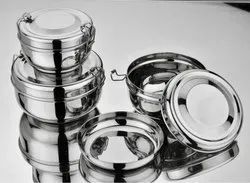 Running with a purpose of attaining the highest level of customer gratification and trustworthiness, we are offering a distinctive assortment of Stainless Steel Dabba to our respected customers. Accessible with us in miscellaneous standard sizes and stipulations, we also provide the facility of altering their sizes as per the necessities and requirements of our patrons. Furthermore, we deliver these in best grade packing material to our customers. We are an eminent organization engaged in manufacturing a wide assortment of Lunch Box to our clients.